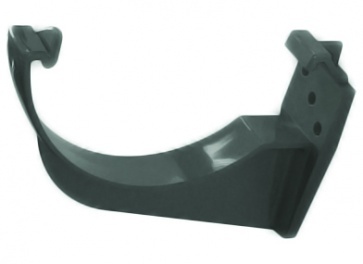 FloPlast Anthracite Grey Half Round Guttering Bracket / Fascia Bracket. New from FloPlast their Anthracite Grey Half Round Gutter system. This fitting suits the Half Round Plastic Guttering system from FloPlast which measures 112mm across the open top and 52mm deep. Please note: This is FloPlast's interpretation of Anthracite Grey. The closest RAL number to this colour is RAL7024 (Graphite grey) A slight difference between this and RAL 7016 (Anthracite grey) can be seen when compared together at close quarters but when installed any difference is hard to see.